ENGINE: 24 pieces comprise the 4.6 liter SOHC modular V8, and the parts count is only one indication of how much detail Revell has lavished on the engine alone. The engraving is first-rate to say the least. The five-piece induction system and detailed serpentine belt/pulley unit are especially worthy of mention. A tiny decal is provided for the oil filter cap – now that’s attention to detail. There’s plenty of good references, both in print and online, on the 4.6 as used in the 2010 Mustang, and these will come in handy when it comes to detailing and painting the engine. Completed, it looks fantastic. CHASSIS: The basic chassis has very good engraving throughout and features only the gas tank and spare tire well molded in place. Front suspension is a seven-piece unit with separate steering rack, and the rear suspension is a nine-piece assembly with separate sway bar and traction bars. Disc brakes are found on all fours, but these could stand to be augmented by a reasonably decent photoetched set such as that from Crazy Modeler and a set of resin calipers from Hobby Design or Crazy Modeler. The exhaust system is one piece with two turned metal exhaust tips – a feature we have come to like very much from our friends at Revell. The underhood area is well catered to, with the engine compartment molded as part of the interior unit and the battery, fuse holder, and washer reservoir molded in. Separate engine compartment goodies are the two-piece radiator with electric fan, radiator shield with expansion tank, firewall with two-piece master cylinder unit, and shock tower brace. WHEELS AND TIRES: Plated 19” five-spoke Mustang cast wheels ride on black vinyl no-name low profile performance tires that have very good tread detail. INTERIOR: The interior shell has only the package shelf molded in place; all other components are separate. Side panels are separate, have excellent three-dimensional detail, and include rear B-pillar insets. Decals are provided for the door handles (! ), speaker grilles, and Mustang logo. Front seats are two-piece with back detail, and the rear seat is a one piece unit that can be omitted by those intending to turn this pony into a quarter miler or oval racer. Moving to the dash, the basic unit has superb engraving, a separate hanging pedal unit, a separate turn signal stalk, three-spoke Mustang steering wheel, and a clear gauge cover to which you have your choice of any of six decalized gauge faces with different backlit shade, just like the real car. Also decalized are two choices for the radio/multimedia/navigation screen. Shifter and hand brake are separate components, and there is a sun visor/overhead console/rear view mirror assembly that slots in at the front inside of the roof. BODY: The subtle differences between the 2010 restyle and the 2005 original have been carefully crafted by Revell. The subtle side curvatures have been handled very well. The front fascia/main grille is a separate part, to which attaches the separate headlight reflectors with clear covers, the tiny clear side marker lenses, the chrome galloping horse emblem, and the clear fog light lenses. At the rear is a separate fascia with molded in taillight reflectors that will need to be treated to a shiny chrome of your choice, and over these go two clear light lenses that will need the transparent red treatment. A chromed gas cap and separate lip spoiler finishes up the rear. Side mirrors are two-piece with separate chrome lenses. The hood has the GT’s domed appearance and very good underside structural detail. All windows are thin and virtually distortion-free, and fit flush from outside the body. DECALS: On the all-new decal sheet, in addition to those previously mentioned, are hood/cowl/top/trunk/rear deck striping in silver, white, or black, the black rear panel between the taillights, wheel centers, rear side marker light lenses, the center high mount stoplight lens, silver GT emblems, gas cap center, two black and white GT license plates, two Illinois “2010 GT” plates, and two Arizona “GITTYUP” plates. COMMENTS: Revell’s deft updating of their excellent 2006 Mustang into the 2010 mid-cycle refresh makes a really good kit even better. The detail in this kit is nothing short of superb, and built, it’s impressive. One could only wish for someone to do a photoetched detail set for this one to enhance what’s already there (ahem, MCG????) 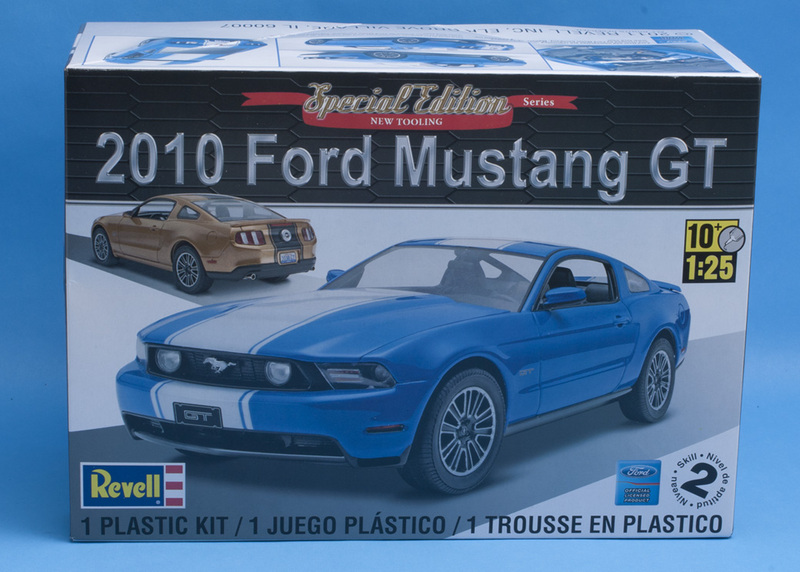 If there was any issue to be taken with this kit, it’s the opinion of many that Revell should have waited and brought this kit out as a 2011 GT with the fantastic new 5.0 liter “Coyote” V8 engine – and perhaps they just might have that in mind, knowing Revell. 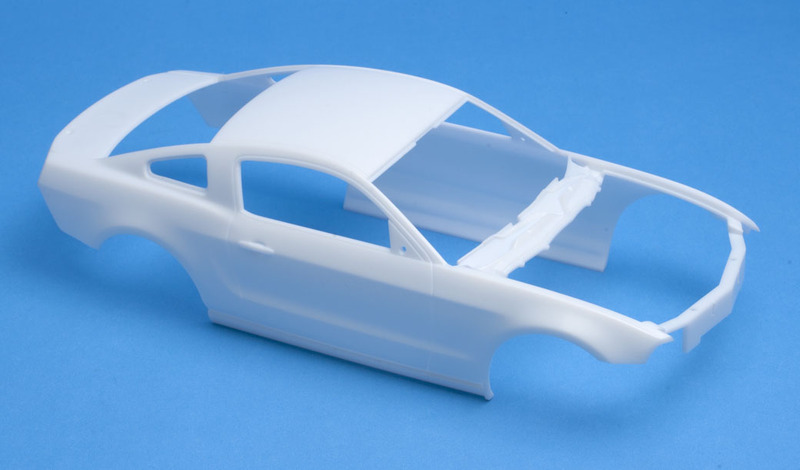 A companion Shelby GT500 is on the way too, in both 1/12 and 1/25, and we will look under both hoods as soon as we can. In the meantime, what’s here is highly recommended; I just have to do one in Grabber Blue – now THAT is a looker!